Hi Does the profile come in text format or just PPL? This is the only profile that has Finished 1st 2 times now unasissted in 45 man MTTs at Bov.A few other profiles have made 3rd and 2nd a few times but couldn't muster up the win like "The Champ " can!! 95% of the time when the profile loses it is due to badbeats.All in all the profile plays like a pro and i'm very satistfied. 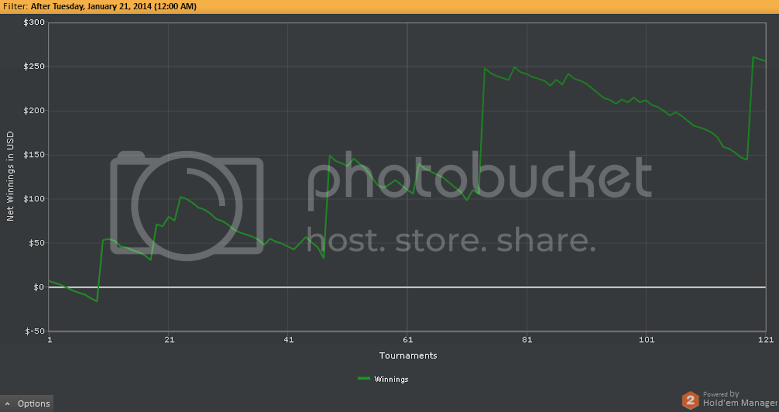 Just a FYI, after my 2nd MTT yesterday.. I placed in the final table of a Guaranteed event (>500 entries). Looking forward to see what it does going forward. TY! will post a graph in the journal section after I get a good sample. Yes we all get that. It has been repeated several times now. If I get a good sample size , the price will triple. I'm more then allowed to post early reports back to me good or bad. profile sent. best of luck. even if you have a winner(mtt profile), it will only help mix up your play and confuse your oppionents, by adding this to your collection. Hey man check ur PM, sent you one. no prob. you have been a long time, well respected member. if and when you feel comfortable , maybe you can give us some thoughts on MTTCHAMP. Sent you an e-mail Monger!